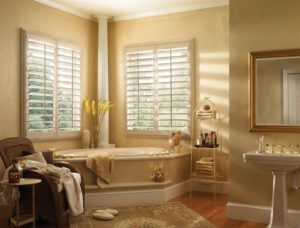 Vinyl Shutters transform ordinary windows into inspiring highlights of the home. Combining elegance with the durability of vinyl they are perfect for windows everywhere: formal living rooms to rough-and-tumble playrooms – even busy kitchens and steamy bathrooms. Our vinyl shutters are fire retardant and child safe. Their lightweight design with internal air pockets provide an elegant solution for large windows as well as being energy efficient. Easy to maintain, washable and waterproof, they will not fade, crack or chip. 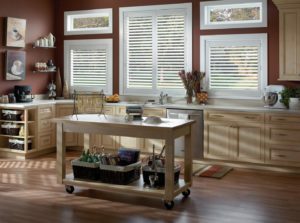 Tier on tier offers the versatility of separate shutters on top of each other. Each opens individually for the ultimate light and privacy control. Café style cover the bottom part of the window, leaving the top uncovered. This continental look is perfect for overlooked windows whilst allowing natural light to flood the room. 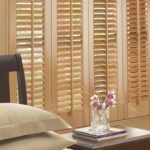 For large windows shutters can be folded or slide away. Vinyl shutters are available in a choice of three colours – cotton, pearl and vanilla. A wide variety of window coverings that can be custom-made to fit your windows, no matter the shape or size. Our vinyl shutters are fire retardant (tested to the performance requirements of BS 5867-2: 2008 Type “B”) and child safe.